São Paulo, Brazil 4 April 2017 – SRSG Santos Pais joined leaders from business, government, civil society and academia at the 9th Global Child Forum in São Paulo Brazil. 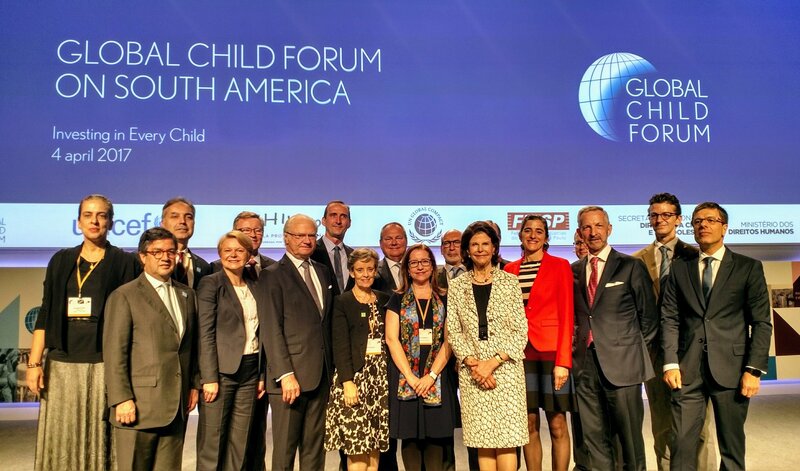 The Forum was devoted to the theme “investing in every child” aimed at identifying and sharing good practices to address some of the most pressing challenges facing children in the South American region. SRSG Santos Pais called on the private sector to promote innovation and creativity in the protection of children’s rights. "To make a real difference we must move beyond principles and commitments towards implementation of practical responses that give young people real opportunities to thrive in life. Business accountability must start with the rights of the child and to their protection from violence.” said Ms. Santos Pais. SRSG Santos Pais highlighted that violence against children also has significant short, medium and long-term economic costs that are borne by individuals, communities and societies and that realizing the right of children to a life free from violence requires sound investment in child protection. “The corporate sector can add its influential voice to global efforts to prevent and address violence against children. It can use its leverage with peers and partners, support advocacy and mobilization campaigns and legal reforms, and raise children's awareness. It can also partner with governments on innovative initiatives, for example using ICTs to strengthen birth registration." added Ms. Pais. The Forum featured inspiring speakers, plenary panels and interactive sessions and provided insights and tools to companies on how they can best contribute to advancing children’s rights in South America. The Global Child Forum convenes every year and is chaired by HM Karl XVI Gustaf of Sweden.